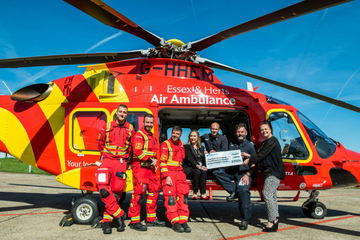 The term ‘Essex & Herts Air Ambulance Trust’ or ‘us’ or ‘we’ refers to the owner of the website whose registered office is Essex & Herts Air Ambulance Trust, The Business Centre, Earls Colne Business Park, Earls Colne, Colchester, Essex CO6 2NS. Our Charity registration number is 1108989 at Essex & Herts Air Ambulance Trust, The Business Centre, Earls Colne Business Park, Earls Colne, Colchester, Essex CO6 2NS. You may not create a link to this website from another website or document without Essex & Herts Air Ambulance Trust’s prior written consent.